I think I have a spring in my step in today's post for a few reasons. First, the weather has cooled down considerably here in Los Angeles and it finally feels almost like fall. Second, I got my hair cut and the few inches that I had my hairdresser take off make me feel like a whole new person. (Goodbye split ends, hello fabulous!) 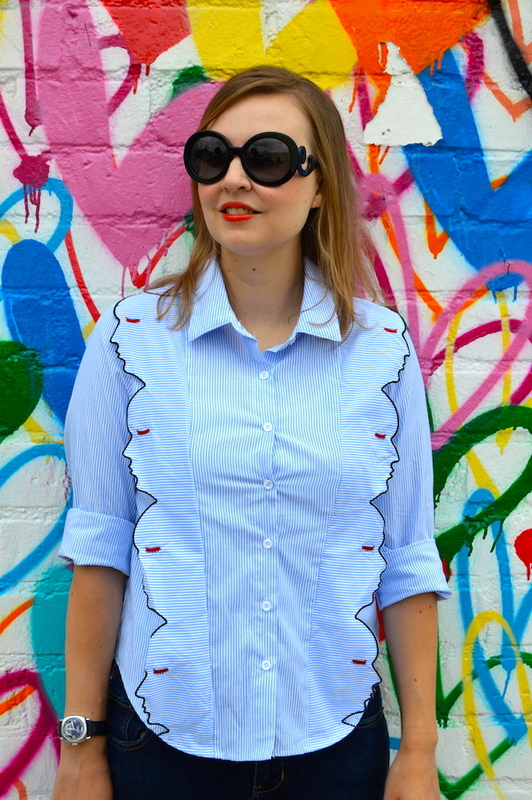 Finally, this fun button-down face top has me feeling fabulous as well! I currently own three of these "face" tops from SheIn that feature fun face shapes. This blue and white stripe one is the newest addition to my collection. Even so, I am actually thinking about buying this one with a hand shaped collar too! 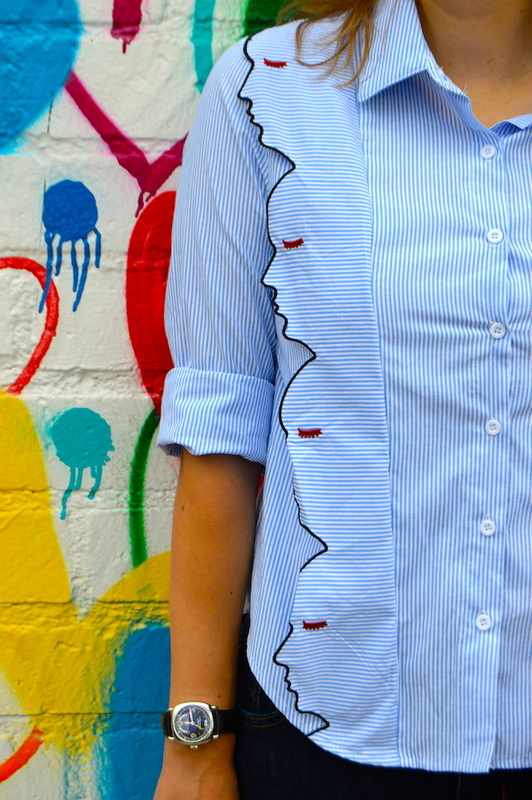 I love how these "face" blouse designs take a classic staple, here a blue and white striped button-down shirt, and make it avant garde with the addition of these quirky faces. Also, at under $20, they are a fabulous deal, especially when you compare them to the ones from Vivetta, which retail for $300-$400 each, that these are styled after. 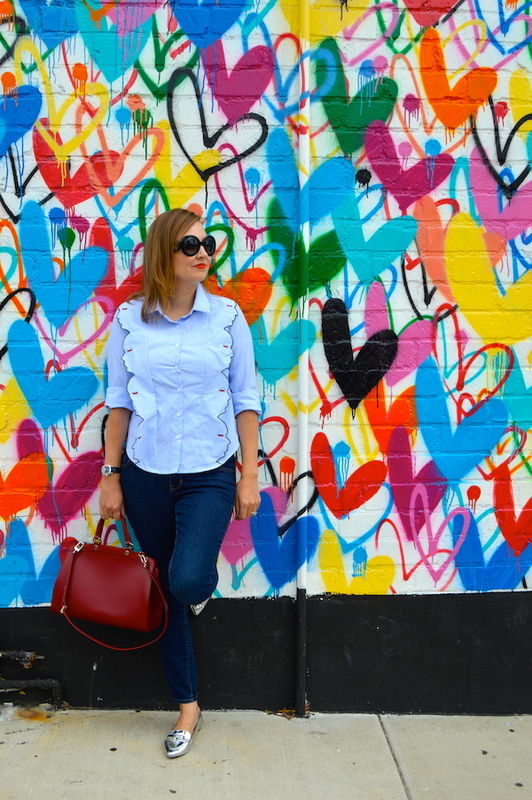 It's definitely safe to say that I "heart" these face tops, hence my burgeoning collection! 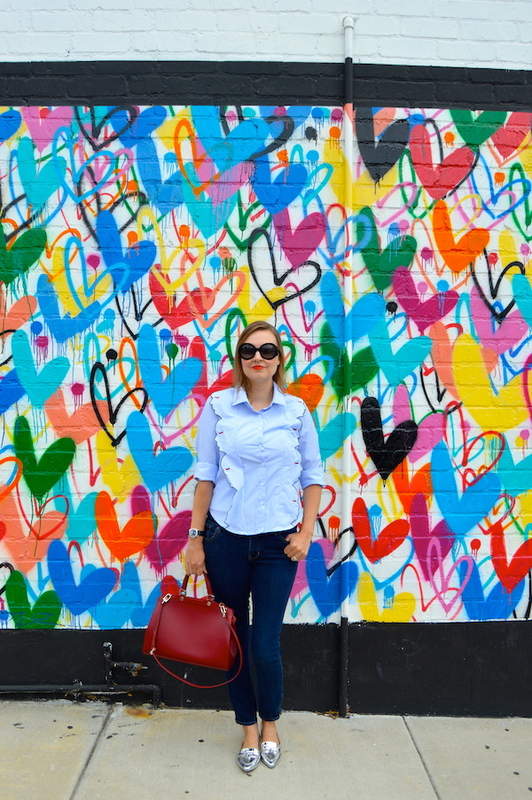 Come to think of it, I would say that this heart wall and my silver loafers also put a spring in my step! These loafers that I bought last year from ASOS are super comfy and perfect for strolling along the boulevard on a Sunday afternoon, which is where and when these photos were taken, or for being at work on my feet all day. The loafer trend seems like it's going to be hot again this fall, so I have included a few of my favorite metallic options below. Hairdressers always make me feel so fabulous! Also those metallic shoes are perfect for fall! Yeah for cool weather!